OCEAN PARK (NZ) (Bay 2008-Stud 2013). 8 wins from 1200m to 2050m, MVRC WS Cox P., Gr.1. Half-brother to the dam of SW Grunt. Sire of 143 rnrs, 74 wnrs, inc. SW Ocean Jewel (WATC Placid Ark S., L), SP Another Dollar, Mongolianconqueror, Pretty to Sea, Seaway, Dancer's Kin, Ocean's Fourteen and of Ocean Knight, Beerzatbernz, Tezlah, Kolding, Matowi, Oceanex, Clement Legend, Fictitious, King Opie, Lucky Win Win, Ocean Deep, Pink Graffiti, etc. Storytime (f. by Savabeel). 2 wins at 1200m to 2017-18, Rotorua RC NZB Insurance Pearl Series H., 2d ARC Eight Carat Classic, Gr.2, 3d Manawatu RC Eulogy S., Gr.3, Taranaki RC Oaks Prelude, L.
Sense of Hite (f. by Street Sense). Winner at 1000m, 2d VRC Gucci S., L, SAJC Sportingbet S., L.
O'Behave (g. by O'Reilly). 2 wins at 1000m, 1200m in Aust. Dare to Compare. 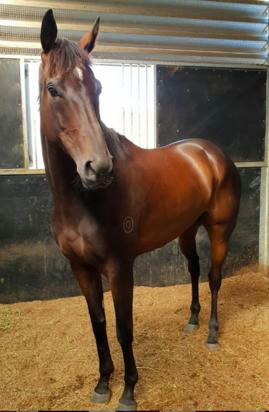 Winner at 2100m in 2018-19 in NZ. Miss Verne (f. by Ocean Park). See below. ETYMOLOGY (New Approach). 5 wins from 1400m to 2800m, A$889,735, to 2018-19, VRC Bagot H., L, ATC Australia Day Cup, L, VRC Happy Holidays H., 2d Victoria Derby, Gr.1, South Australian Derby, Gr.1, VRC St Leger, L, ATC Cellarbrations H., VRC Juvenile Diabetes Research Foundation H., ATC Anzac Day Cup H., 3d MRC Caulfield Classic, Gr.3, ATC Spring Preview H., MRC Cove Hotel H., ATC Membership H., Triple M Marquee H., VRC Employee Volunteer H.
Cabeza de Vaca (Northern Meteor). 7 wins from 1350m to 1900m, A$346,475, to 2017-18, ATC Robrick Lodge Filante H., November H., Merry Christmas from James Boags H., Tooheys New Evening Star H., 2d ATC Villiers S., Gr.2, TAB Rewards H.
Authoress (Fuji Kiseki). 4 wins. See above.